Historic Blakeley State Park encompasses over 2,100 acres of the largest National Register Historic Site in the eastern United States. 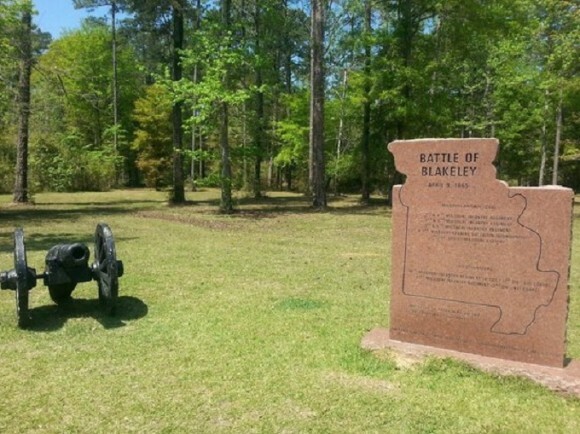 The park's grounds include the site of the last major battle of the Civil War, including several miles of unspoiled Confederate and Union fortifications associated with the Battle of Fort Blakeley of April 9, 1865; the site and remnants of the important early Alabama town of Blakeley; colonial era homesteads, and evidence of American Indian habitation from the Archaic, Woodland, Mississippian, and Historic periods. The park features regular boat excursions into the scenic and historic Mobile-Tensaw Delta, and offers over fifteen miles of hiking, biking, and horseback riding trails, plus RV and tent camping facilities, as well as fully-furnished cabins. Special educational programs and tours take place throughout the year.